Choose from a Sprint or Olympic distance or form your own team to split the challenge up into a swim, bike or run. The venue is superb & your entry includes a post-race meal of jacket potato, 1 filling (plus a bottle of water) served at Race Village next to the finish line. The swim is set in one of the beautiful, clean, spring fed lakes where the temperature in 2015 was 23 degrees & 19degrees last year. (Wet suits are optional). The bike leg takes you out of the venue via the main entrance into the surrounding undulating Lincolnshire countryside the Sprint distance has a 1 lap course. The Olympic follows the Sprint course over 2 laps. The Sprint and the Olympic distance have a little more elevation, yet still takes in some beautiful scenery. Staying within the private park, the run follows the road running past the sailing centre with lakeside views. The residents come out to cheer you on making it a friendly atmosphere & gives you the encouragement you need for the final leg. TEAMS: The team consists of 2 or 3 members. If your team has 2 members, the first member will conduct the swim and the run and the 2nd member will conduct the bike. If your team has 3 members, 1-member conducts EITHER the swim, the bike or the run. The team can consist of British Triathlon Federation members and non-members. Any non-members must pay their £5.00 Day Licence fee at registration on the day of the event. This is an exciting way to try a Triathlon for the first time or for the more experienced to improve your skills at a cracking local venue whist raising much needed funds for your local hospice. We plan to hold regular training and taster sessions throughout April and May. We are entering into the spirit of the Spring Bank Holiday, and putting on a Fun Day of epic proportion! At East Carlton Park from 12noon there will be an abundance of activities, from the Lakelands Fair with stalls and tombola to the Lakelands Dogshow! Plus Dance Perfomances, Children's Rides and Inflatable Fun. Rise to our #challenge??? this June and help raise vital funds for our Hospice at Home Service. Each year the #challenge number increases because the number reflects how many patients our dedicated team of nurses have cared for in their homes in the last few days of their lives. In 2015, #challenge300 was born, last year the campaign reached #challenge518, moving into 2019 sadly this figure continues to rise. However, as a hospice we are incredibly proud to say that we are continuing to fulfill the final wishes of our patients by enabling them to pass away in the comfort of their own homes, surrounded by their loved ones. To help us continue providing our invaluable Hospice at Home Service Rise to our #challenge this June. A fundraising pack is available to help you with ideas – but remember be creative, wacky and zany, literally anything goes!! 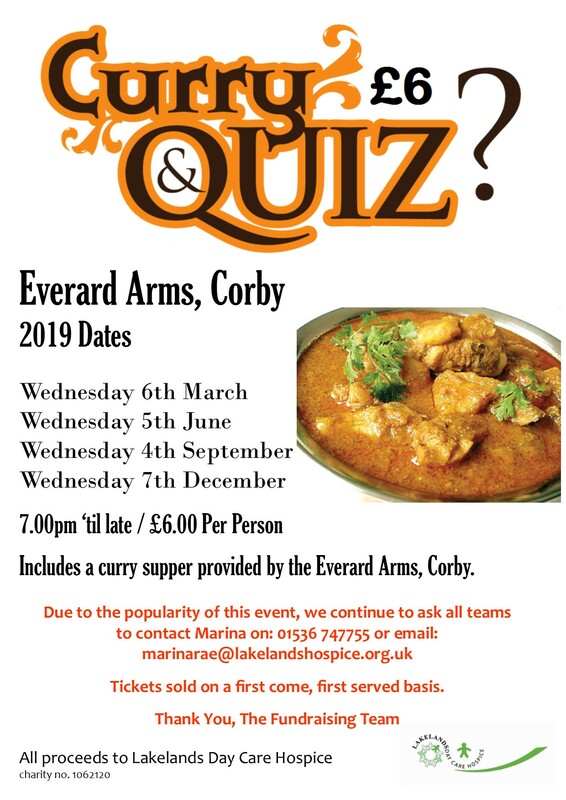 Join us for the Lakelands Curry and Quiz night kindly hosted by The Everard Arms. Fantastic raffle prizes to be won. Join the fundraising team from 7.30pm for a night of fun that will test your brains.